1. What is Bloom’s Taxonomy? Why was it created in the first place? According to the videos and research that I made, Bloom’s taxonomy divide teaching and learning into three domains: cognitive domain, psychomotor domain and Affective domain. It used to classify educational learning objectives into different levels of complexity and mastery. 2.How do teachers use it? Looking back on your own learning experiences do you think you had teachers that were using Bloom’s in their classrooms? In the video “Intro to Teaching: Bloom’s Taxonomy for Discussion Questions”, the teacher use it to help preparing her discussion in class. Instead of asking lower level of basic knowledge she prefer to ask higher level questions(for example evaluate level/ application level). In this way teacher can avoid letting student repeat the same things over and over again. Also by using Bloom’s Taxonomy students are able to combine the knowledge with their own experience so that they can easily analyze or apply the knowledge to their own life. From my learning experiences my teachers had definitely used this way in our class room. I think it is a really efficient way for me to learn new things. Especially when we were having a discussion about what we have learnt, cause during discussion, our teachers usually asked us about personal experience that have connection with a certain kind of knowledge and it helps me to understand the knowledge deeply. 3.Based on just some quick research, does Blooms seems accurate to you? If yes, what parts resonate with your own understand? If not, which parts don’t agree with you own understanding? I think Blooms is accurate to me. Cause according to my own experience, when I am learning new things, I always find it boring to repeat the same information over and over again. It is also really hard for me to remember the learning objective if it do not have a strong connection with my own experience. On the opposite, if the things that I learnt have a strong connection with my own experience and I can easily apply it into my own life, then I find myself able to remember it easily and hard to forget it. 1.What is a misconception? Does activity based learning alone remove them? Misconception according to my own understanding based on the video is that people may use their own experience or other conceptions that already exist in their mind to analyze new things. And they are not aware of the fact that their own experience and conception they had can lead to a wrong understanding about the things that they are trying to learn. I think this activity cannot be removed only by learning. Cause in that video even if they already give the student the right concept they still analyzing them with their own thinking or conceptions they had before. So I think it cannot be removed by learning alone. 2.Are misconceptions only applicable to the sciences? If so please explain why it would not apply outside the science? If you think they are applicable outside the sciences, please think of some non-science misconceptions you or someone you know might have had. I think it is not only applicable to the science. For example, in our daily life, we sometimes argued with people around us and most of the times it is because of misconceptions. When something happens people are more likely to analyze it according to their own experience, however our analyze might not what the truth is so that will easily created misconceptions. 3.Is the stuff discussed in this video in anyway related to Bloom’s? Elaborate on your answer. I think it is definitely related to Bloom’s. Cause in the cognitive domain, higher level of learning new things is to analyze and evaluate the things that we learn. And analyzing and evaluating those things need the information and the personal experience that we already have. So that it is easy for us to analyze a new things according to the old concept that we had. And that sometimes will created misconceptions. 1.What is the MTV approach’s criticism of Blooms? The MTV approach’s criticism of Blooms is that the idea that thinking is sequential or hierarchical is problematic and Blooms makes teachers only care about the “higher-order” of thinking. But in reality learning a new thing sometimes requires student to move back and force from lower-order of thinking to higher-order of thinking several times till they really understand it. 2.Did reading this criticism change you feeling about Blooms? I guess instead of saying it changes my feeling about Blooms, it actually helps me understand deeply about Blooms. Cause it pointed out the limit of Blooms and how we should use it wisely. 3.Do Blooms and MTV approaches share the same goal? Where do they differ and where are they similar? I think they share the same goal that learning is a product of thinking so that to support student to lear, we need to support them to think. However MTV requires teacher to think about the problem of in what kind of specific part do we want to support this student. In other words, what does the teacher want their student to do mentally. Blooms only requires students to not only have lower-order thinking but also have higher-order of thinking. 4.Does either approach being to address the challenges the Mind Of Our own video raised about how we teach? In “The Mind Of Our Own”, the challenge it mentions is that people will unconsciously analyze a thing according to their own experience and it will leads to misconceptions. 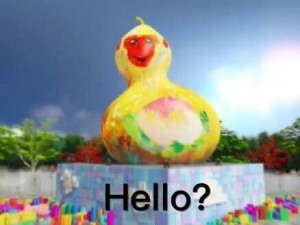 In MTV, it gives an example of the process of a child to learn paint. It pointed out that that sometimes leaning a new thing requires people to think back and force from lower-order thinking to higher-level thinking several times so that we can learn the new things. I think it is same with how we should remove misconception, we need to reanalyze it serval times and test the possibilities over and over again and again till we get to the right answer. It is surprising to read that even today with the advancement of new forms of media like television, internet, and radio, paper production and usage is still increasing. Today’s world survives off of paper yet still the majority of us are completely unaware of the disastrous impact that its’ production has on the source of paper i.e. trees. It was ironic to read that according to the author many books have been written about the importance of trees. However, the thought that tonnes of trees were cut in order to print those books completely defeats the purpose of spreading awareness about tree conservation. Nowadays, even though a lot of people recognize the significance of trees in their lives, they still fail to act in order to protect them. In my opinion, the first step to reduce deforestation has to be taken by the general public. It is our everyday habits and increasing demand for paper products that lead to its’ increasing manufacture. So in essence we control the destruction of our environment. And in order to prevent this destruction, we need to start conserving trees and learn to give back to the environment. Carelessly cutting trees can solve many of our problems; however it can also lead to many new problems that could stay with us for the rest of our lives. It takes no time at all to cut a tree yet it takes years to fully grow a new one. That simple thought should be enough for people to realize the scarcity and nonrenewable nature of wood. And as for the genetically modified trees that the author mentions, one needs to realize that problems cannot be solved simply through tampering with nature. To me, genetically modified plants as a means to quickly replenish forests is a shortcut way to regain the destroyed environment. However, this shortcut may have permanent and disastrous consequences. Therefore, the use of genetically modified plants does not seem practical to me as it has numerous risks associated with it. The best way towards a green future is to reduce our everyday paper consumption and to stop carelessly cutting down trees. Every tree is linked to the environment that it grows in. And to cut that tree would mean affecting the whole ecosystem around it. This week, we were asked to read about Bloom’s Taxonomy, watch a video, and read an excerpt about MTV approach. The first three come into “Foundation Thinking” while the rest come into “Higher Foundation Thinking”. This ‘system’ was created in order to help teachers teach students. Looking back at my academic career, I think barely a few of my teachers actually based their teachings on proper ‘thinking’ and ‘analyzing’, but based it mostly on memorization and applying from memory. ‘Understanding’ was never part of it. However, looking back at the past year and a half (my college career), most of my professors have based their teaching more on ‘understanding’, ‘analyzing’ and ‘evaluating’. As much as I have read so far, I think Bloom’s Taxonomy is a good technique to get students to ‘think’ and learn effectively while ‘understanding’ at the same time. According to this excerpt, Bloom’s Taxonomy is an effective way to teach students, however, it has its drawbacks too. One of the drawbacks mentioned in the excerpt was that whenever teachers were asked to explain what sort of ‘thinking’ they encouraged their students to do, they had no answer. On the other hand, others answered by asking if one was aware of the term “Bloom’s Taxonomy”. So it is not completely inefficient. Another thing that the excerpt stated was that the ‘thinking’ that Bloom’s Taxonomy mentions, is not usually done in the same order as mentioned. I found this to be very interesting, as I did not ‘think’ (analyze/evaluate) about it as such. Reading this excerpt did change the way that I thought of ‘Bloom’s Taxonomy’, however, it did not make me think of it being any less effective than I initially thought. However, both ‘Bloom’s Taxonomy’ and the MTV excerpt, share the same goal; that is, making education a form of proper defined ‘learning’, and not merely just ‘memorizing’ and ‘studying’. What is Bloom’s Taxonomy? Why was it created in the first place? Bloom’s Taxonomy is a system of ways of learning, including mental states such as remembering, applying, analyzing and creating. The system is organized in a pyramid-like way, with the most engaging forms of learning at the pinnacle and the more elementary forms of learning at the bottom (see below picture). It was designed by Benjamin Bloom in 1956 as a framework for categorizing educational goals for K-12 students. How do teachers use it? Looking back on your own learning experiences do you think you had teachers that were using Bloom’s in their classrooms? Because Bloom’s Taxonomy is a organized collection of learning goals, teachers use it to design their own lesson objectives and plan their activities around them. 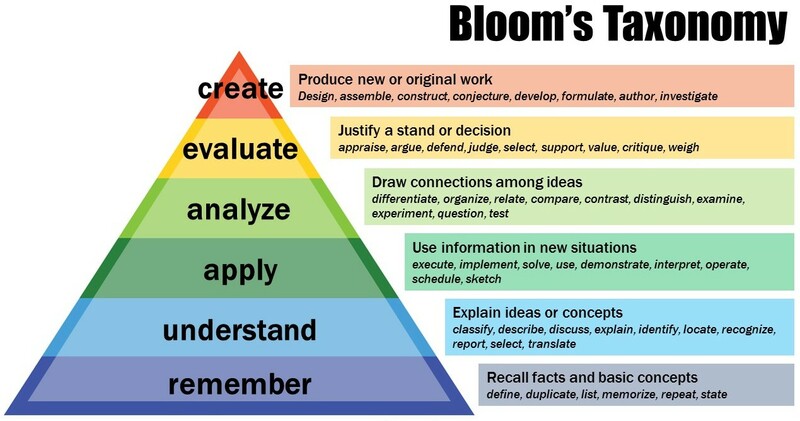 From the Youtube video about how Bloom’s is used for teachers’ discussion questions, it seems that Bloom’s Taxonomy also comes in handy when a teacher is trying to help students reach deeper levels of thinking incrementally, so the learning process comes naturally but students are still pushed to challenge their analytical and creative willpower. I remember having English teachers who would tell us to approach our reading assignments with Bloom’s Taxonomy in mind. We would summarize passages, using “remember”, make connections between the text and our own lives (apply), debate the validity of themes found in the text (evaluate), and develop our own viewpoints in conjunction with our literary research (create). As a result of my teachers’ use of Bloom’s Taxonomy, I became more attuned to the types of learning that I was experiencing in the classroom. This made it easier for me to track my progress in the long run, as I improved with activities relating to deeper levels of Bloom’s such as evaluating and analyzing. Based on just some quick research, does Blooms seems accurate to you? If yes, what parts resonate with your own understand? If not, which parts don’t agree with you own understanding? Yes, Bloom’s seems accurate to me because each step is building on top of the others and there is a very clear goal for students that I believe is valuable. For example, understanding is made possible by remembering past resources/knowledge. And only by applying these fixed lessons can one begin to add in more individual ideas and feedback, ultimately leading to a creative product/idea. What is a misconception? Does activity based learning alone remove them? A misconception is a perceived truth that is actually the result of ignorance. I don’t think that activity-based learning alone removes misconception because miconceptions can develop into powerful beliefs that require constant correction to remedy. Are misconceptions only applicable to the sciences? If so please explain why it would not apply outside the science? If you think they are applicable outside the sciences, please think of some non-science misconceptions you or someone you know might have had. No, from my experience misconceptions can be found in almost any subject and topic. Although among the sciences there are more fact-driven corrections to misconceptions, many non-science misconceptions are the result of a lack of communication and ignorance. Between individuals, misconceptions about cultures, behaviors, status and intention can develop simply from not paying enough attention or from being stubbornly rooted in ignorance. For example, racial and cultural stereotypes can be misconceptions because they are generalizations. Or, the inconsistencies in individual nations’ histories has also led to misconceptions regarding our collective human history. What is the MTV approach’s criticism of Blooms? MTV believes that Bloom’s is incorrect in assuming that there is one pathway to deeper levels of thinking. In fact, MTV questions the one-way road that Bloom’s Taxonomy is on; using the example of the little girl who paints experimentally, MTV expresses that there are situations in which we learn effectively by not following the order of thinking that Bloom’s dictates. Learning habits are situational and by neatly categorizing them, we can falsely perpetuating the idea that learning is a predictable and systematic experience. Did reading this criticism change you feeling about Blooms? Yes, I am glad that I read MTV’s criticism after researching about Bloom’s because I slowly started to agree with the arguments that MTV brought up that contradicted with Bloom’s organization. It’s true that learning is not sequential; I have had no problem following Bloom’s Taxonomy when, say, dissecting a book for a writing class, but oftentimes I find myself learning in sporadic, experimental ways that are naturally helpful because they are not systematic. When I come across a problem on my homework, I don’t need to consult Bloom’s Taxonomy to solve it but rather I take what I need and develop my own solution free of constraints. Do Blooms and MTV approaches share the same goal? Where do they differ and where are they similar? Both Bloom’s Taxonomy and MTV have the best interest of young students at heart, so yes I believe that they share a goal. However, MTV has a more radical perception of how learning should be defined compared to Bloom’s. In contrast to mapping out the levels and areas of thinking, MTV argues that there doesn’t need to be a clear-cut route to finding depth in learning. IN the example with the painting girl, learning spontaneously occurs when one is faced with a challenge. MTV also disagrees with the theoretical format of the Taxonomy, remarking that there is no way learning can be devoid of “context and purpose”. *I was not able to watch “Mind of Our Own” so I could not answer the below questions. I will try to once I receive the video. Is the stuff discussed in this video in anyway related to Bloom’s? Elaborate on your answer. Does either approach being to address the challenges the Mind Of Our own video raised about how we teach? E.M Foster’s “The Machine Stops”, is a fantastic piece of writing that is fully related by people in the modern day. Even though the piece was written in 1909, it very accurately describes how technology has made people dependent on it to the extent that people consider it as illiterate if someone does any action the old fashioned way (without using technology). Children these days barely play any sports; all they do is come home from school, open their iPad or computers and start playing games, or surfing the internet, or chatting with friends, etc. It is impressive how an author who wrote this a century ago, has managed to get a very important point across, even though such technology did not exist back in the day. I feel the ending of the piece was very well written, as it is only when ‘The Machine Stops’ , that people realize that it is not, as written in the piece ‘god’ or something worthy of ‘worship’, as it is not immortal. Dependency on technology, is bad. One should know how to use it and exploit it, but make sure that one does not overuse it to the extent that life would be incomplete without it. “The Work of Art in the Age of Mechanical Reproduction” by Walter Benjamin is another old essay that, in a way, talks about “art”. According to Benjamin, art from back in the is not the same as modern art. Secondly, he also says that when art is ‘replicated’, it is not the same as the original as something is lost from it – this could range from the amount of hard work and thought that went into it, to its ‘context’. The “aura” of the art piece changes when it is replicated. He also mentions how there has been a shift in the taste and style of art over time in history and that it has, as a result, changed the way people look at art (in a way). So it is significantly different now, than what it used to be, and we, living the modern world of today, cannot comprehend that “aura”. His point of view is valid, and I agree with him. American educational psychologist Benjamin Bloom suggested there are six distinct types of thinking: remembering, understanding, applying, analyzing, evaluating, and designing. Not only are the types of thinking distinct from one another, they are also placed in a hierarchical sequence. According to Bloom, remembering sits at the bottom and designing at the top of the pyramid, with other types of thinking placed between the two extremes. The purpose of Bloom’s taxonomy is to provide a greater understanding of the learning process. The model is based on the premise that learning results from thinking. By extension, higher-order thinking results in better learning. Teachers often refer to Bloom’s taxonomy when creating lesson plans. Specifically, an emphasis is put to devise activities that require higher-order thinking (i.e. synthesis, creation), since it is thought such types of thinking increase the quality of learning. Some of the teachers I had were aware of the different types of thinking and planned classroom activities accordingly. For instance, my history professor in high-school neglected minor factual mistakes and instead sought understanding of a given historical period or event. Understanding was thus given precedence over remembering. Also, most of my professors in college have so far put focus on activities and assignments that fostered higher-order thinking. In their book Making Things Visible: How to Promote Engagement, Understanding, and Independence for All Learners, Ron Prichart et al. criticize the sequential nature of Bloom’s taxonomy. The sequence in which the different types of thinking are placed becomes problematic when Bloom’s framework “guides instruction for learning”. The taxonomy breaks thinking into discrete parts. If Bloom’s model is taken as the basis of lesson planning, the lessons are likely to be divided into a set of activities calling for discrete thinking types. Such an approach fails to recognize the coexistence of different thinking types and thus neglects activities that call for several types of thinking at once. In addition, if the thinking types are ordered by importance, there is a tendency to prioritize higher-order thinking to the exclusion of foundational thinking. Importantly, Prichart et al. do not entirely reject Bloom’s taxonomy. Rather, the authors emphasize that Bloom’s framework should not be followed to the letter. Bloom merely provided a framework, a useful “starting point for thinking about thinking”. One does not have to agree with Bloom to understand the importance of his work. Thinking is indeed nuanced and occurs on different levels. By identifying and discussing these nuances, our ways of teaching and learning can only be enhanced. I believe that the past 20 years of rapid development of World Wide Web is continuously changing people’s life, while also modifying itself. The creator of the Web says that he hope the Internet can keep its universality and decentralization, and become a world that is free to all of the users around the world. But actually it’s almost certain that this dream won’t happen in my opinion. Think about how many secret information is flowing through the Internet every day in every connected place. We use e-purse to consume, which requires sending bank account codes and stuff. The online e-commerce, stock trading and banking requires high secrecy and information safety. The involvement of business and economy requires the Internet to be able to keep users’ secret instead of sharing anything online. Even the consumption behaviour data of an ordinary person can be of great value. At a time when Internet tycoons own the definite percentage of resources, such as search engine and social networks, it is inevitable for ordinary people to use the product of these companies and provide their consumption data. This is a fact the threatens the whole online society. 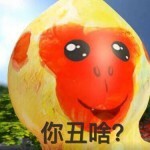 The recent hot news, as an example, in China, is about the giant search engine company Baidu sell the ownership of its post bar (some kind of forum) to companies so that the buyers can post ads in the post bars, and Baidu’s search engine has been criticised a lot because its search results are full of ads. 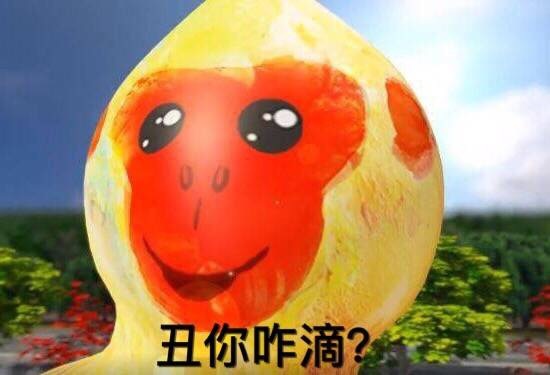 However, because so many Chinese people use Baidu to search for information, companies have to pay Baidu so that their web page can be putted at the top of search results, otherwise no one will visit their page. Therefore, as long as we want to enjoy professional and developed technology provided by these Internet tycoons, we have to face that fact that they control the resources which determines how we surf the Internet and what do we get when we search on the web, and as long as these companies are making profit from it, there’s always a motivation behind for them to violate the spirit of “universality”. So the Internet can only be relatively free space after all. In the first lab, I felted my first fabric character, which is an ugly monkey mascot. I felted some condective fibers behind the layer of its face, and used LEDs as its eyes. 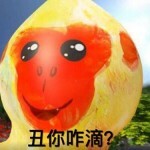 So that when the LEDs are conneted to power, the monkey’s eyes will flash. I encountered one problem when I attached power to the LEDs, the LEDs continued blinking. My professor told me it is because there aren’t many conductive fibers. 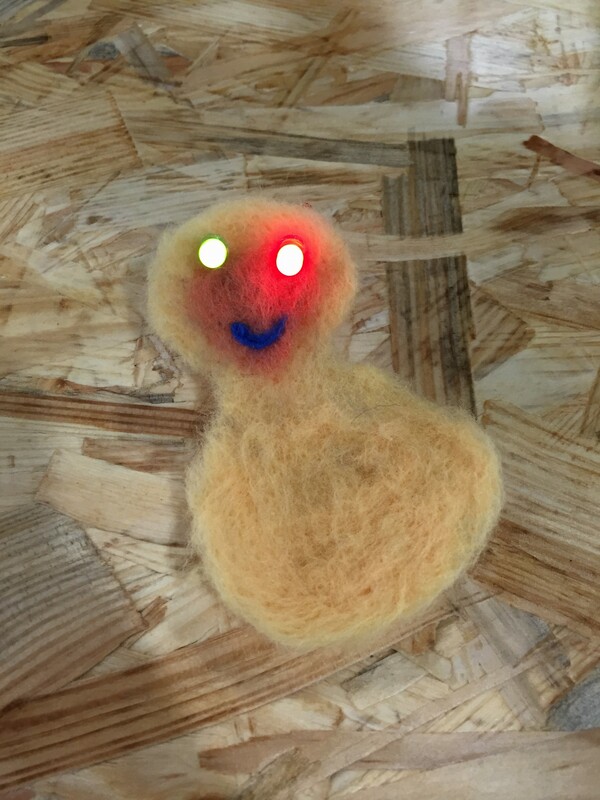 We changed the position a little bit, to where there are more fibers, and then the LEDs worked well. 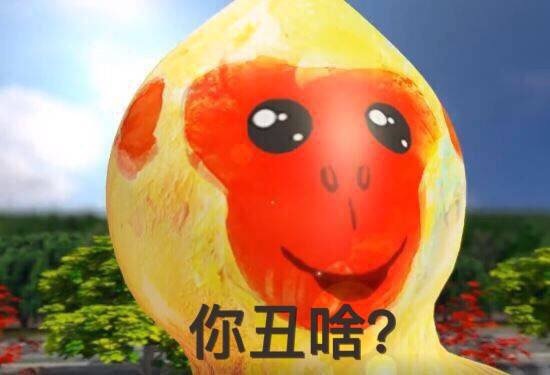 By the way, the original character of this ugly monkey is the mascot designed for the 2016 Taiwan Spring Festival, which is believed by many people as so far the ugliest mascot in China. My first experience with solar power was near the end of elementary school. Our class had a field trip where we went to NASA’s Jet Propulsion Laboratory ( JPL ) in California. Although it was a long time ago and I don’t remember too much, I do recall thinking that the place was super awesome. Here were a bunch of engineers dedicated to sending stuff into space! One of things that I do remember from the place was seeing models of the Mars rover. Aside from the curious looking head, the solar panels were one of the rover’s most prominent features. It almost looked like a table, but far more ornate. On Mars, scientists can’t change out the rover’s batteries, nor are there charging stations. The staff explained to us that solar panels were an excellent solution since cosmic bodies are always being hit with lots of sunlight. As long as Mar’s dust storms don’t completely cover the panels, the rover will run. Because of this experience, I always associated solar power with space. However, solar power is now being touted as a source for energy here on Earth, hopefully a sign of great things to come. Fantasmagorie is Émile Cohl’s take on stop motion animation in 1908. At a glance, this piece looks like it was done with chalk on a blackboard. However, Cohl actually did the animation on a piece of white paper by using black ink and then reversed the negative, creating the blackboard effect. Such technique was actually firstly introduced by J. Stuart Blackton in his “Humourous Phases of Funny Faces” two years earlier. However, I think many agreed that Cohl did just a great job in making use of this particular technique. Fantasmagorie told a story of a hand-drawn clown who came alive and explored the life of characters on blackboard. Unlike Blackton who drew a rather intricate figures and facial features, Cohl mostly made use of simple lines and geometrical shapes. This adds a child-like feel to his work and helps him create a rather humourous, fun quality to the entire short animation. Moreover, Cohl also managed to make the entire transition between scenes and actions within a scene run fluidly. There are parts when it was hard to tell what was going on, especially because the drawing is small and the character moves at a rather fast pace, but overall, I believe that Cohl had done a good job in ensuring fluid flow of story and fun quality to the movie.